Researchers at University of Ghent, Belgium, and Universitat Autonoma de Barcelona (UAB, Spain) develop a new procedure to identify the two extremes of protein molecules and their processing and maturing in in-vivo and ex-vivo massive proteomic studies. The research has been published online at Nature Methods, under the title of "Complementary Positional Proteomics for Screening of Endo- and Exoproteases". The world of proteins is one of the most complex and fundamental in living beings given that these biomolecules carry out and control or intervene in most biological functions. The massive identification and characterisation in a multitude of live organisms and in different vital stages has been and remains one of the most important tasks of proteomics, since it allows for further calibration of their role in biological functions and pathologies/diseases and to develop control strategies (e.g. drugs and vaccines). Until recently most proteomic studies were focused on internal regions of proteins, usually those located in the three-dimensional folding (essential for many functions) or in the N-terminal (-Nt), with a free amine group (-NH2) at the start of the linear chain of linked amino acids. Protein molecules can have either few or hundreds (common in many organisms) and even thousands of linked amino acids, always in linear form, even if three-dimensional folding later takes place. This focalised research is due to the fact that procedures and chemistry needed to study N-terminal and internal regions are easier and can be developed quicker. 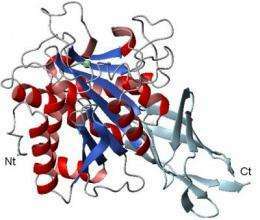 The new method developed by scientists helps to expand studies to C-terminal proteins (-Ct), proteins with a free carboxyl group, COOH, at the end of the linear chain of amino acids. The global and integrated strategy was created by research groups of the University of Ghent, Belgium (Petra van Damme, Kris Gevaert, et. al.) and UAB (Sílvia Bronsoms and Francesc Xavier Aviles from the Institute of Biotechnology and Biomedicine and the Department of Biochemistry and Molecular Biology). In other words, it is now possible to use massive proteomic methods to study maturing processes of proteins which often include breaks in their linear sequence both internally and at their N- and C-termini. Therefore, it will be possible to assess the specific role of these regions in the processes mentioned and in other related functions such as generation, activation and deactivation of hormones, growth factors, neuropeptides, enzymes, membrane receptors and many other proteins with important biological roles. The strategy developed can be carried out ex-vivo (in cell extracts) or in-vivo (by transfection and proteomic analysis). In addition, protein extremes are commonly involved in essential functions, such as locating and directing cells-tissues, triggering the start of three-dimensional folding, joining other biomolecules and macrostructures, post-generation chemical modifications of proteins, etc. This publication completes previous studies (e.g. on N-terminal regions) carried out by the Flemish research group, leader in the field of general proteomics, as well as by researchers at Universitat Autňnoma de Barcelona, leaders in the field of enzymes processing and maturing C-terminal proteins (carboxypeptidases), who recently published an article on the processing of C-terminal peptides in the Journal of Biological Chemistry, by S. Tanco, J. Lorenzo and F. X. Aviles, of UAB, and Ll. Fricker et. al. of Albert Einsten College of Medicine of New York.